Finished at last! I painted a sample figure for this unit in September 2012 and have finally gotten round to completing them as my first heavy cavalry regiment (Montanelli’s Cuirassiers) for the Medetians of the 18th century. These are Minden Miniatures and they were a pleasure to paint. They’re actually British Heavy Cavalry figures which I admit I chose due to their lighter equipment load (ie. easier painting) compared to the ones from Prussia, Austria and France. The flag has a clipart griffon and was printed out from MS Excel and highlighted with paint. The uniform is basically buff coats with Medetian pale blue trimmings, which work well together I think. Although these are now done I admit to thinking about increasing the size of my regular cavalry units, from 12s to 18s – basically to be more in proportion with my infantry battalions (36s). I think 2 squadrons of 6 figures each might look, and be, a little weak compared to their footslogger compatriots so a 3rd squadron may need to be added. Oh well, more painting…! Helping the economy recover – the American one! As per my last post, I have plunged ahead and placed an order for some more of the excellent Minden Miniatures, now in the care of Jim Purky alongside his Fife and Drum collection in the States. 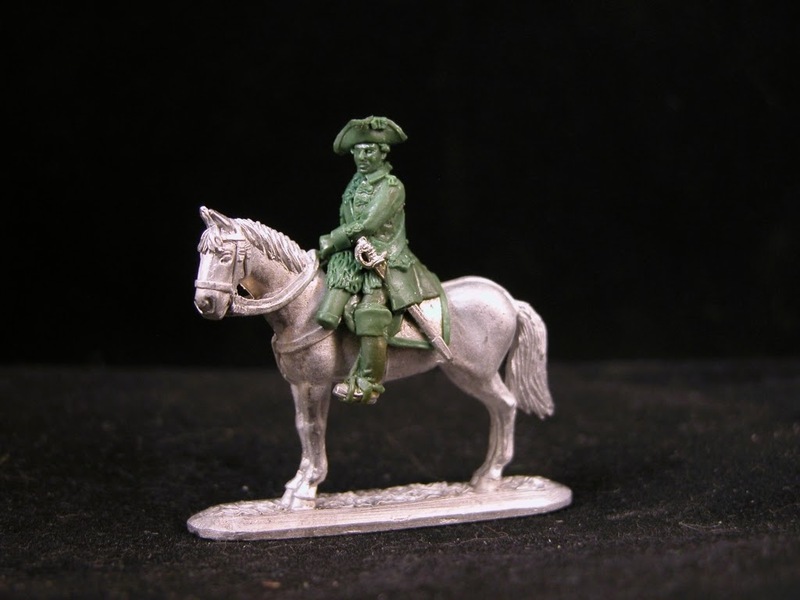 Jim was very helpful in explaining the new pricing model, and generous in providing not only the current offer of $10 worldwide shipping, but also a nice discount in the form of a free Baron von Knyphausen figure (the F&D item I was after amongst the Mindens). See the link below. On the way then are the mounted Prussian and Austrian command packs, more Prussian artillery crew for battalion guns etc, some standard bearers which I prefer to use in units otherwise made up of RSM figures, and a small unit of Dragoons. With the high proportion of mounted figures the order value made me wince a bit – especially considering Christmas is never a cheap time of year, but I need the figures and getting them in one go made sense. Using that logic I then ordered a handful of Huzzah! Miniatures from Fighting 15s, who always provide a super-fast service. These will make up the second command/flag base for the 2 battalions of these figures that I’ve already painted. Finally, I also need just a few from RSM – another company in the US, so I’m having a final ponder about what to get before I commit. Overall this lot will keep me busy for the lead-up to the big 18th century imagi-nation game at Ayton at the start of May. I just hope I don’t leave the last of them until the morning of departure, as I have for the last 2 years!! Author World2DavePosted on 11th December 2013 28th July 2017 Categories PurchasesTags 18th Century 28mmLeave a comment on Helping the economy recover – the American one! Having just finished my latest 18th century infantry unit I have been pondering a small expansion in battalion size – from 30 to 36 figures. The larger size would offer me a number of advantages. The main one is the ability to add a second command base. This provides a second flag (allowing me to have one state and one regiment flag per unit, which always looks good) and I’d then also have the option of playing games with half-sized units and making two from each battalion – something I’ve been thinking about doing in the future. Finally, bigger units look more imposing on the table! The downside is more figures to paint to get a unit finished, and I’d have to go back to the three battalions I’ve done already and add the extra base with its fiddly-to-paint command figures. A Sunday evening painting session finally allowed me to finish the bases and add the standard to the newly raised Vantua Infantry Regiment. I’m very pleased to have made this progress and can now look to finish fairly quickly the other unit I’m working on. As mentioned last time the bases were first undercoated black with slightly thinned matt ink, then painted with Sandtex Chocolate Brown and dry-brushed with Vallejo Iraqi Sand. The foliage and rocks each had two shades, to match my terrain boards. The flag was designed in Microsoft Excel, using a clipart eagle in grey/black and adding the letters A (for Duke Amadeus) and M (for Medetia) as text boxes. The flag is yellow to match the regimental facings so I printed it with a yellowy-brown background to highlight up with brighter paint. I’ve previously done some standards in 15mm using this method and it works pretty well, allowing me to have flags with much better artistry on them than I could ever hope to paint freehand! A bit delayed but I’ve moved the new battalion on to the next basing step. A full covering of sand, stuck down with more wood glue, added to with some cork rocks and.. loose leaf dried tea straight from the packet. This is a hardy basing material with a coarser granularity than sand, and I find it works very well for generic grass/vegetation. I guess the only tip is to avoid immersing your bases in boiling water at any point in the future! Next up, once the glue has dried, a coat of black to seal it all in. In the meantime though, it’s back to the cuirassiers I’ve been painting, and which will get a post of their own soon..
Actually, as a pre-stage 1 activity I sealed the bases first with a slightly watered-down coat of wood glue (I believe PVA shrinks a little as it dries so I avoid it now for basing) so that the bases wouldn’t warp later. You never know if this will be 100% successful until a bit of time has passed, but hopefully they’ll stand up to the rest of the basing and painting process. Once the figures were in place I (carefully!) applied a layer of ready-mixed filler all around the figure bases to bring the ground level up to a consistent height. While they are drying I’ve taken some quick pics (below). Next up comes the really messy bit – applying a layer of sand. I used to stick this down with nice thick black masonry paint (and still do on the odd ocassion where I’m basing unpainted figures) but as you can imagine, one accidental swipe of the brush and that’s a lot of re-painting to do! Nowadays it’s clear PVA or wood glue as a damage limitation tactic. I hope to get this stage done tomorrow. .. I’ve finally finished the next battalion of 28mm musketeers for my mid-18th Medetian century army. Why is this a big deal? Because I started them in July and frustratingly ground to a halt a few weeks ago, despite being within sight of the end. This created something of a self-induced painter’s block as I was determined to finish them before painting anything else. Although these Huzzah! Miniatures figures (from Fighting15s) don’t perhaps have as much detail as some, the uniforms of the day still make them a challenge to paint en-masse. 30 figures is a lot for me in one go, and I’m not the quickest, so units of this size require a fairly big investment of time. Seeing them ready for the table is, of course, the reward – so I need to crack on and get them based now (and add a standard). In truth, I’m also intending to add a battalion gun and a grenadier company, but psychologically it’s important to tell myself the unit is ‘done’! In the meantime, here are the newly raised Vantua Regiment who will soon be formed up in close order ready to march off to join their comrades in the (slowly) growing Medetian army. The lighting isn’t great today as one of my spotlights has failed and it’s very dull outside! Author World2DavePosted on 18th November 2013 28th July 2017 Categories FiguresTags 18th Century 28mm6 Comments on At last..